Here is a simple method of divination that can be done anywhere anytime. All you need to do is spend a few minutes gathering stones. Half should be dark and half of a lighter colour. Place them on the ground before you. Ask your question or keep it in mind. 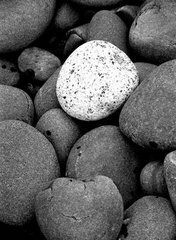 Close your eyes and jumble the stones around for a few seconds; then, with your left or receptive hand, remove one of the stones. If you picked a dark stone, the answer is yes or the prospects favourable. If light, no.